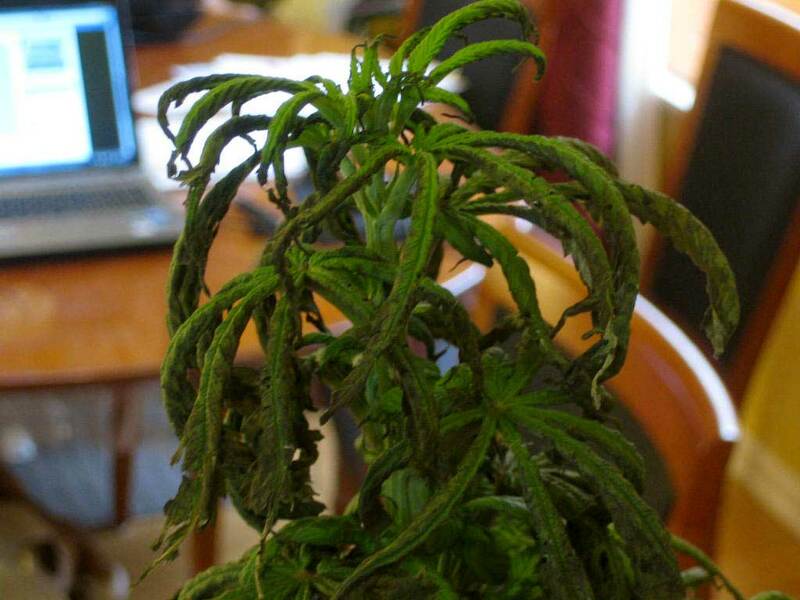 Question: Why is my whole plant wilting, curling, with tips turning black and leaves turning yellow? Just flipped to flowering stage. Plant is drinking less than normal. Additional info: Grown in coco coir with Fox Farms nutrients. Have been growing this plant from a seed and was in veg state growing very well with CFL lights (6500k) 24/7. Very full and bushy plant with many leaves and smelled nicely. Switched to flowering stage by changing the lights to 12/12 (2700k). 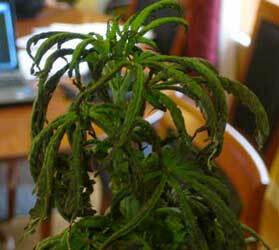 Two day later, the plant leaves were drooping, curling inwards, drying out and tips were turning black. Other leaves were a bright green and now almost yellow. During veg stage plant was getting PH'd water and mixture of Grow Big and Big Bloom. On 5/9 plant got mixture of Tiger Bloom and Big Bloom. Plants have always been watered with PH'd water but noticed as of recently it wasn't drinking as much. 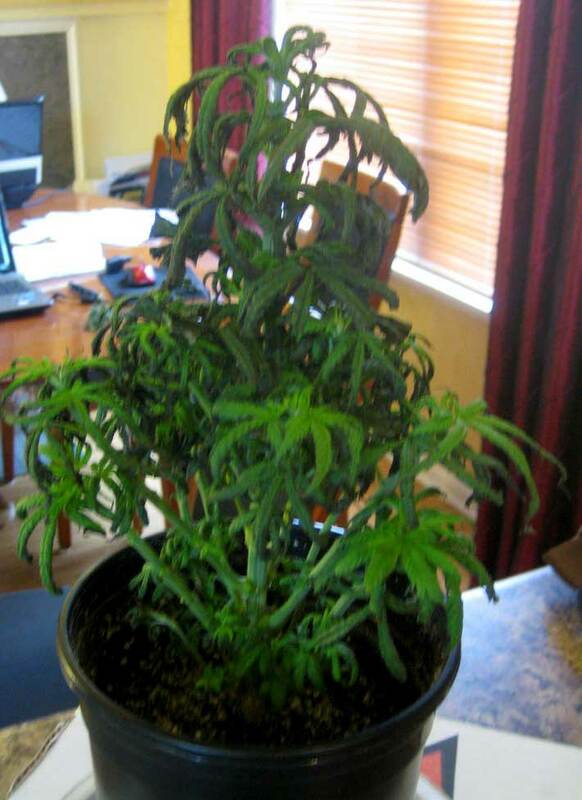 As of 5/11 I have flushed the plant with PH'd water 3 times in case there was salt buildup. I have also hand sprayed the plant hoping it would help the very dry leaves that were close to dying. After all this the plant looks worse today and hoping I can still save. Not sure what has caused it to start dying but please help. 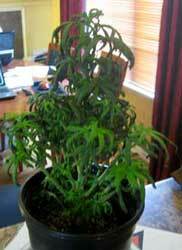 Answer: This plant is showing classic signs of root problems like root rot. The fact that your plant is drinking less than normal also seems to indicate that there's a problem at the roots. 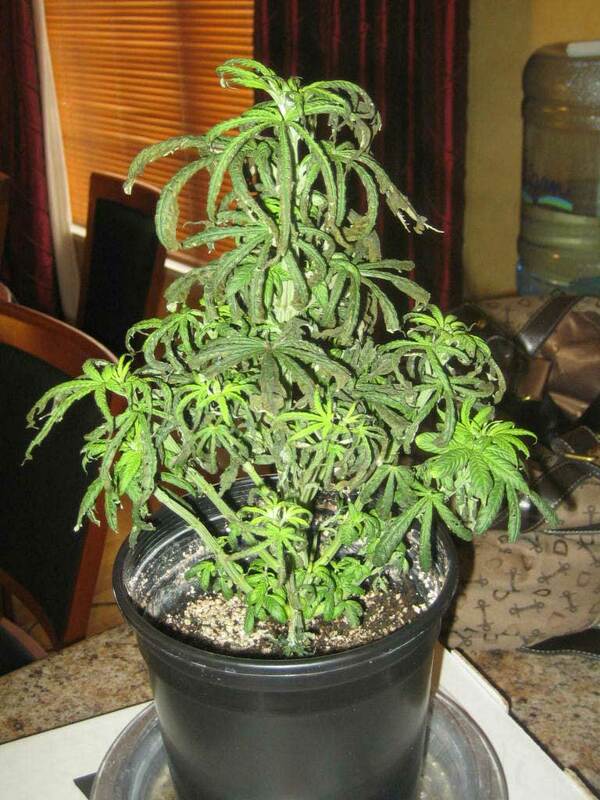 When the whole plant seems to just "deflate" overnight, it's often caused by root problems. Heat can be a trigger (root bacteria love warm temps) and will also make this problem worse. Root problems often hit growers in soil or coco coir soon after the flip to the flowering stage, especially with less powerful lights like CFLs. This is because plants use a lot more water when they're receiving 24 hours of light a day. When you flip to 12/12 light for the flowering stage, it's easy to overwater plants if you continue watering them on the same schedule. 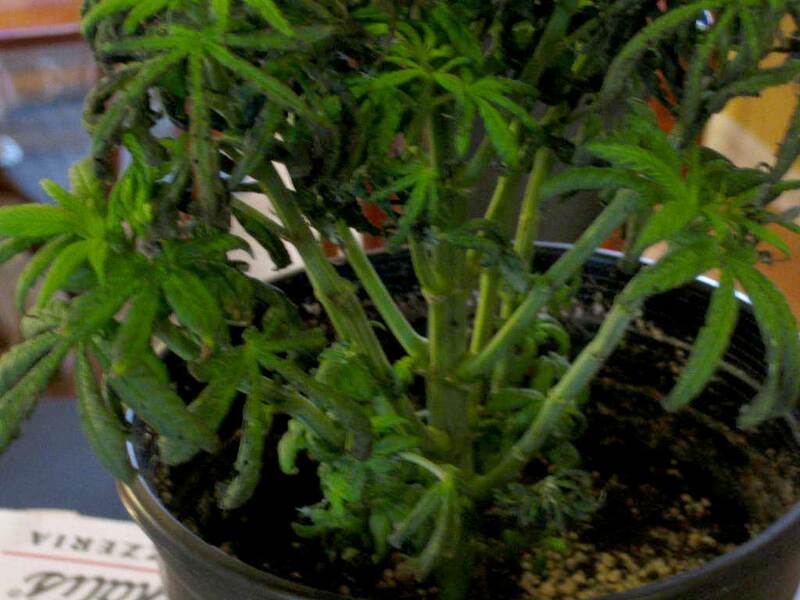 It's important to user proper watering practices throughout your grow. If you think you may have root problems, there are two easy ways to deal with this. 1.) You can purchase Hydrogen Peroxide in 3% – 35% strength. Mix 1 cup of 3% Hydrogen Peroxide with a gallon of water. For 35% strength Hydrogen Peroxide, mix one tablespoon to a gallon of water. Water your plants with the mixture to kill any bacteria living in your root area. Unfortunately, hydrogen peroxide also kills good bacteria, which can protect your plant from future infections. 2.) (My prefered method) Conversely, you can start adding Aquashield to your nutrient-water when you feed. This will build up colonies of good bacteria that out-compete the bad bacteria and actually promote plant growth. In addition, the beneficial bacteria will offer protection for those times when the temperature of the grow area rises at a time when you can't control it. When I first got started with bubbleponics, I had a few tough bouts with root rot. Over the last few years, I've tried many "good bacteria" products including the ($$$) Great White and Subculture B additives, but no product has ever worked 1/4 as good at maintaining healthy roots as super cheap, readily available Aquashield. If plant medium seems to stay wet no matter what you do, you may need better drainage. It may also help to move plants to a smaller pot until they get bigger and start drinking more. Make sure that water drains freely from the bottom of your container (it's recommended that you provide enough water to get at least 20% extra runoff every time you water your plants). You should see water coming out the bottom within a minute or two after watering. Then don't water your plants again until the soil is dry up to your first knuckle. For soil / coco coir grows, you generally only want to water the plant when the soil feels dry if you press a finger in it. You can also use the "lift the pot" method to decide when to water your plants (basically wait until your pot feels "light" since the plants have used up all the water). For other growing mediums besides soil, your watering method will vary, but if your plants are drooping and you've been feeding them a lot of water, it's a good idea to cut back and see if that helps. If your plants are already overwatered, you can try to increase airflow to help the water evaporate more quickly. You can also use a pencil to gently poke some air holes into the growing medium to provide extra aeration and oxygen to the roots. Some growers will even replant a heavily overwatered plant, to get some oxygen immediately to the roots. How do I manage pH in my marijuana grow?